Does Coiba Dive Center accommodate divers of all skill levels? What exactly does Sharks Guaranteed mean? We guarantee that anyone doing a three-tank dive in one day will see sharks or you will be refunded the entire cost of your trip, minus the $20 park entrance fee. Are meals provided by Coiba Dive Center during trips? During our multi-day trips, Coiba Dive Center provides all meals, beverages and snacks. During one-day trips CDC provides purified water, choice of sandwich and snacks. What are the departure and return times for trips? For all trips guests will need to arrive at the dive center at 8 AM to check in, pay balances, get fitted for rental gear as well as hear our pre-dive briefing. The boat leaves Santa Catalina at 8:30 AM and usually returns by 4:00 to 5:00pm. Can I pay the total balance when I get back from a trip? No. You must pay the full amount before departing for your trip. Do I need to bring my certification card? Anything I should make sure I bring? Your certification card if you are planning to dive. Plenty of water resistant sunscreen so as to not go home too fried! Digital camera batteries are only found in Panama City, so bring what you need. There is no pharmacy in Santa Catalina, so any other supplies that you may require. Your sense of humor and sense of adventure! 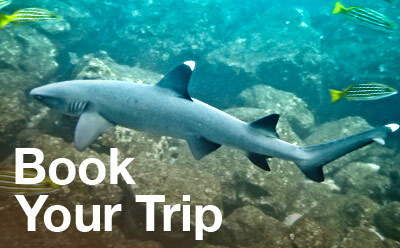 Are there any special rules when diving at Coiba National Park? Most of the areas that we dive, including Coiba, are either World Heritage Sites and/or national parks. There are specific rules that must always be adhered to under the guidance and auspices of the National Park regulations. You may not touch animals or remove fauna, flora or marine plants. Even taking dead coral is heavily frowned upon. We take great pride in our backyard and are not the type of dive operator to turn a blind eye.﻿ We will go over all the park rules with you during your pre-trip briefing. Santa Catalina is a small fishing village with a tranquil, laid-back atmosphere. Many people visit the village for its popular surf break and easy access to Coiba National Park. There are a few other local services, such as wakeboarding, fishing, massage and yoga. Due to Santa Catalina’s location on the Pacific, we experience a tropical climate year round: temperatures hover between 30 and 34 degrees Celsius (90 to 100 degrees Farenheit) during the day and drop into the 20’s (70’s F) at night. Is there a bank in Santa Catalina? The closest bank is in Soná, an hours´ drive away, with one ATM available. We recommend stopping in Santiago for cash on your way here as more banks are available there. 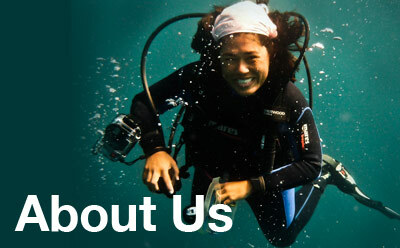 Coiba Dive Center presently accepts Visa and Mastercard for tours. There are only a few other services in Santa Catalina that accept credit cards so make sure to bring sufficient cash for your stay. Is there a gas station in Santa Catalina? There is no gas station in Santa Catalina. Fill up in Santiago or Soná to avoid any issues. What about telephone communications, internet, etc. in Santa Catalina? There are two public phone in the village; telephone cards (for local or international calls) can usually be found at one of the two nearby stores. Cellular service is available. You can purchase a sim card for Panama at the airport or at the cellular provider office. MasMovil has good service in our area. Are there any supermarkets in Santa Catalina? We have two small food stores here which carry basic staples. It is always a good idea to purchase whatever you need in Santiago, however. What restaurants are available in Santa Catalina? There are several restaurants in the village offering a variety of culinary options, including traditional Panamanian food, fresh seafood, vegetarian options, Italian and more. Are there any drinking establishments in Santa Catalina? Santa Catalina has several great places to stop in for a drink. These range from restaurants with full bars, to smaller bars with a laid back atmosphere, to the local ¨cantinas,¨ which consist of a blasting jukebox and cheap beer. Should I be concerned about bugs? Santa Catalina is the least buggy tropical place we have been so far, but it is always a good idea to bring bug spray.